Sarah Walker races alongside nearest rival Rebecca Petch in contention for the NZ women’s elite title. 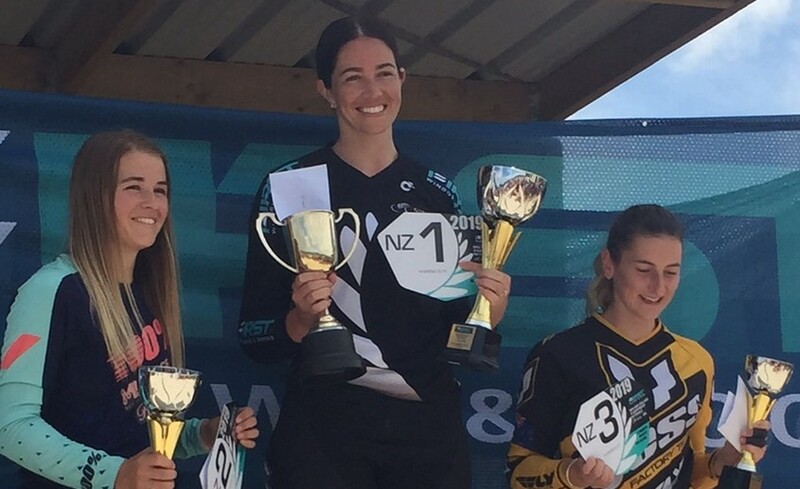 Cambridge BMX champion Sarah Walker managed to add another notch to her belt before heading off on her honeymoon on Monday last week, reclaiming the elite women’s title at the New Zealand BMX Championships in Te Awamutu over last weekend. After qualifying second behind defending champion Rebecca Petch, Walker used the best of her experience to hold off the Te Awamutu rival in a closely-fought final. “It was such a good battle and I think the hardest national title ever,” Walker said. “Massive kudos to Rebecca. Sarah Walker claimed the elite honours at the National BMX Championships. 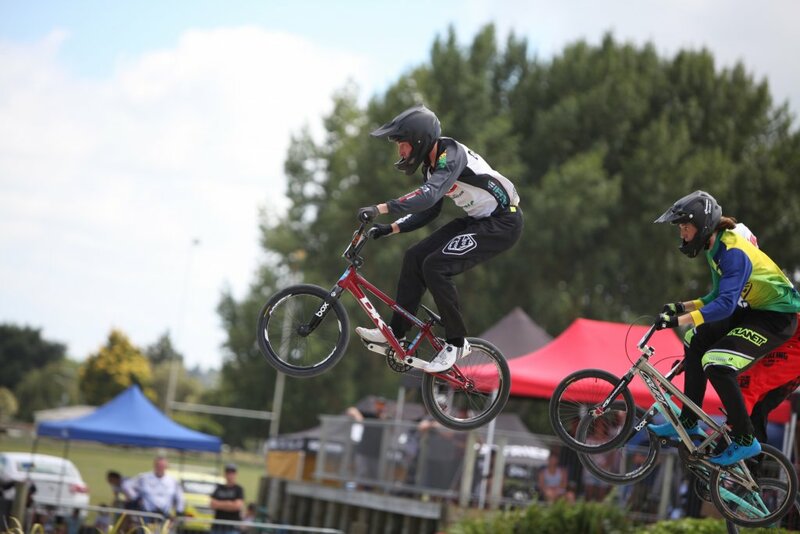 On Saturday the Te Awamutu track hosted another big event, the Oceania BMX Championships, where riders from the Cambridge BMX Club recorded 15 podium finishes. Some of Australia’s top riders were amongst the 439 competitors on Saturday, presenting a worthy challenge to the 30-strong Cambridge club team which boasts several world podium-placers. It was no surprise six-time world champion Leila Walker won the 14-year-old girls final, or that world number three Lily Greenough finished third in a tough-fought 12-year-old girls final. Her brother Jack Greenough also finished first in the 14-year-old boys final, and their older brother Bennett won the 16-year-old boys final. Leila’s brother Noah also won third overall for 12-year-old boys. The youngest of Cambridge’s seven first-place finishers were Beth Walker and Oscar Newnham, both winning the nine-year-old girls and boys divisions respectively. Other local first place-winners included Logan Hall, first in the 15-year-old boys final, and Dallas Douglas, first in the eight to twelve-year-old cruiser final. Louis Hunt finished second in the 13 to 14-year-old cruiser final. Also making the podium from Cambridge was Kobi Russell, third for ten-year-old boys, Kellee Cryer, second for 12-year-old girls, and Tyla-Shae Donaldson, second in the 17+ women’s final. Greer Hall won bronze in both the 13-year-old girls final and in the female cruiser class. Tasman Wakelin races ahead of the pack in the junior men’s final. Last year’s world number three Tasman Wakelin managed to add to Cambridge’s gold medal count with a first-place run in the junior men’s division, quite the feat after moving up from the 16-year-old age group to junior men’s 17 – 24-year-old racing this year. This followed on from Tasman’s success in the National BMX Championships the day before, winning the 17 – 18 year old junior elite men’s final. 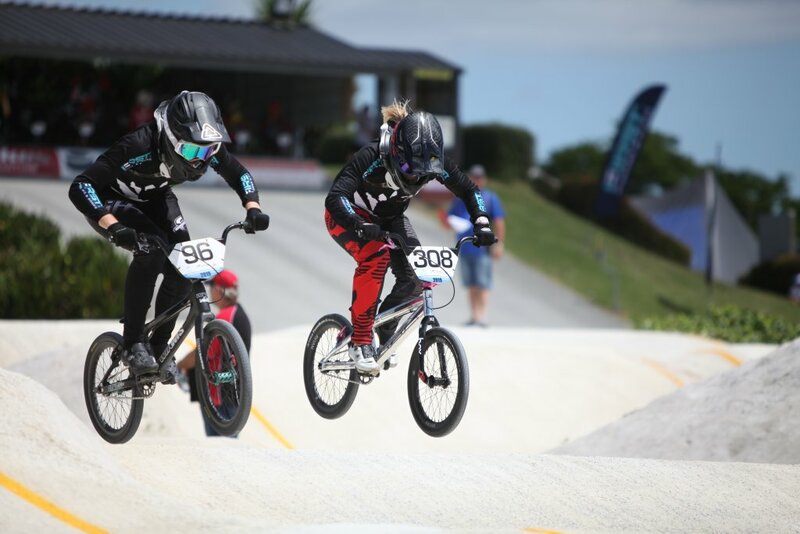 Two more local BMX performance hub riders, Charlie Lester-Rosson and Rico D’Anvers, also finished third and fourth respectively in their national finals.